HOUSTON: Rish Oberoi is excited about joining Ekal Vidyalaya Houston as Zonal Development Director since it involves two of his favorite things. Making a difference and flexing his fundraising skills. As Development Director, Rish’s job involves rallying support from Corporations, strengthening donor base, coordinating with other Ekal Chapters on projects and events and tapping young professionals who want to give back. The young 27 year old has joined Ekal to promote the organization’s work of uplifting India’s rural and tribal areas through literacy and vocational skills. This “wanting to make a difference” here or in India was always important to him, Rish says, of his motivation to work with Ekal. He is highly inspired by Past President Barack Obama and like him, Rish too wanted to do something to better the world. In 2016, after graduating with a Bachelors in History and a minor in PoliSci from the University of Houston, Rish joined HISD as an Associate Teacher while working for his Teacher’s Certification. It proved to be a short stint as he soon grew disillusioned with the state’s handling of the public school system and its failure to be effective for marginalized communities. It was evident to Rish that several things were wrong in society and he believes that “it goes back to who’s running the Government.” Perturbed, he called up the office of Mark Gibson who was running for the 22nd District Congressional seat and volunteered for the election campaign. It was totally new territory for Rish and a formative learning curve for him. Gibson didn’t win but Rish got his first taste of politics and a possible career. 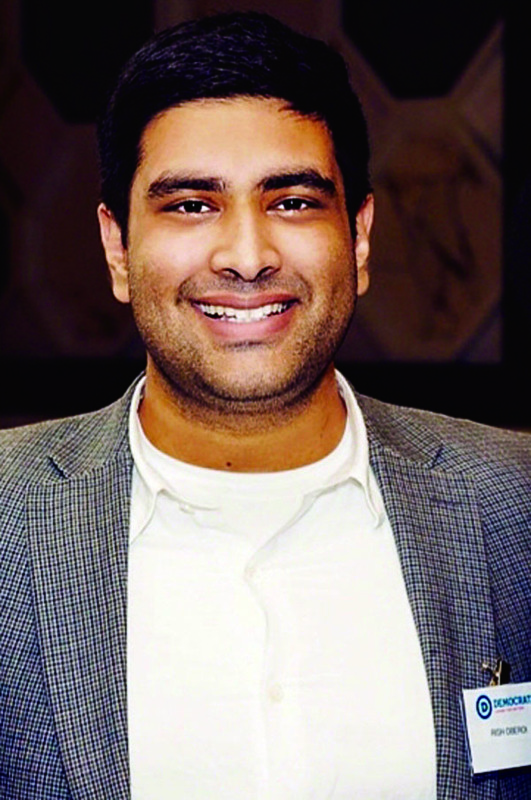 Over the next few years, Rish worked as a Policy Aide in Speaker Straus’s office and crisscrossed Texas as Director of Operations and Travel Aide in Mike Colliers Lt. Governor campaign. However it was with Congressional candidate Sri Kulkarni that Rish truly got in the thick of campaigning and fundraising. As Kulkarni’s Finance Director, their campaign raised over $1 million in four months – a record and double the initial goal. Rish also picked up some useful skills from summers spent behind the cash counter as his father, Ricki Oberoi, owns several franchises of fast food chain Wendy’s. It was an excellent training ground for tangible lessons such as keeping “a cool head with less-than-reasonable customers” to connecting with people. More importantly, he realized that business wasn’t his cup of tea and said as much to his parents. They were understandably taken aback at first, but were always supportive of his decision to carve out his own path. Rish plans to visit a few Ekal schools in India to see for himself how the organization runs 83,000 schools and touches the lives of two million children. He is drawn to Ekal’s concept of not only providing free schooling but also vocational training, digital competence and agricultural education to farmers. As a millennial himself, he’s partial to the Ekal on Wheels – a program that uses mobile buses with computer stations to impart digital skills to children and young adults. During his me-time, Rish enjoys going for music festivals and cheering for the Houston Rockets. He’s also a major history buff and travels to Canada to see his girlfriend Alysha whenever he can.